This telescoping handle is designed for use with 18", 24", and 36" wet and dry microfiber flat mops. It features a heavy duty, robust design for increased durability in a variety of commercial restaurant and janitorial applications. Seems to work well with the corresponding microfiber mop frame and microfiber flat mop head which are also sold by Webstaurant. Honestly though I still like a sturdy wood handle. I thought i would like this telescoping mop handle more than i did, spent more to try and help the night crew out, wasn't any easier, just load up on the cheap ones. you can use it for your floor, your walls, etc. I like the material despite that its plastic outside and aluminum inside. One of most the most amazing things is the fact that you can extended. This mop handle popped up in the recommended options when I was looking to purchase the mop head. That worked great, as I was looking for a complete set. The handle works great for our hard surface floors. I absolutely LOVE this mop handle. I use it to mop and reach cobwebs in the top of the staircase. Sturdy and not flimsy at all. one piece, heavy duty handle. It feels light but sturdy. The extension is a plus. It is very easy to handle. Its the best microfiber mop we've used and very affordable. Mop handle is sturdy. It's just made out of plastic, but it's nice. It's the pivot area of the mop frame that I had some issues with. The mop pad replacement I bought was very sticky and did not do a mop motion smoothly. I think it it stayed up right I would use it more often. The telescopic microfiber mop handle is awsome for reaching! You can use it for your floor, your walls, ceiling painting! I have a ceiling fan in my house that is a 2 story open room. When we finished remodeling, the ceiling fan was full of dust. I couldn't think of a way to clean it. Then I got an idea to use this mop handle to reach the fan from my 2nd floor. It worked great! The Telescoping Microfiber Mop Handle goes with the 18" Microfiber Mop Frame. Sturdy construction, and a vast improvement over previous mop used. Can switch out the dust mop with the microfiber flap mop pad, giving you two tools with one device. Fantastic product, love everything about it: the telescoping handle, the great hand grip area, the outstanding price, the durability, the high quality, and the versatility. I have purchased many of similar design, but none can compare to this one. The rod is very impressive for the price. It is heavy duty aluminum with a strong, cleanly molded plastic handle on the top. It is light but sturdy, and I expect it to last for years. This telecscoping microfiber handle is a nice sturdy handle for any application. perfect for microfiber frames and extends with a simple twist of the handle. This is a great, sturdy mop handle. It extends to a very long length using only one hand and a simple twist locks it in place. Along with the frame and microfiber pad, this makes for a great mop! One of the main components of our microfiber mop system is the telescoping handle. It is great to use with our 18 inch aluminum mop frame. It is a little heavier mop handle because it is heavy duty. I used these at a public school where I cleaned as a janitor they work awesome light weight and does not hurt your back I highly recommend these for school,nursing homes or your own home. This mop handles is the handle for microfiber mop that also telescopes to extend for the right length and reach for different people heights and arms. This telescoping microfiber mop handle is a great handle for any mopping or dusting application. Straight end is compatible with microfiber frames and or similar attachments. Extremely long adjustable reach. Attached right to the microfiber mop head and is ready to get working. Keep it close or extended it for hard to reach places. Really great mop handle. I typically stay far away from any metal construction handles as they usually bend or break very easily. This unit is true to it's description. It really is robust. Doesn't feel flimsy at all and i have no worries about it breaking due to how it's made. This is a nice handle. It has been very durable for us. It does the job, and I have no complaints.So I Would buy this handle again. The handle has a nice grip to it and is a good length. It is nice to have the ball on the end to use for help control the mop. Easy and lightweight to use. Handle is sturdy, thick and easy on your grip. Fits tall and short users with a twist to lock in place. My favorite Mop Handle. Other telescoping microfiber mop handles are far less durable than this one. This handle is very thick and does not give any bend when applying pressure while cleaning. Great for residential or commercial use. This is a sturdy, versatile handle. We like the fact that it is adjustable and it works with several styles of mop heads. We use it with frames for wet moping an dry dust moping. This handle is working out great for me. It can be made to be short or long depending on my needs. It is of strong material. The telescoping aspect of this handle is really useful in our cafe. W haven't had it long but the twist action to lock it out seems to be holding and hasn't loosened during use. These telescoping microfiber mop handles are sturdy and easy to attach to the aluminum mop frame pads. I love the telescoping handle that allows me to adjust the handle to fit my height. You can also use these mops to clean windows and hard to reach corners in your home. I will never go back to the old mop and bucket days after using these aluminum mop pads with telescoping mop handles and a wide assortment of Velcro cleaning pads to meet your cleaning needs! This is perfect for any size store and getting under hard to reach areas is a breeze. The long handle makes it possible. Love it. We really did not have a good experience with this mop. Nobody at our business really liked it because it flips over when you're using it no matter how hard we tried to prevent it. The flat part also kept separating at the joint which you can pop back in. Eventually it broke completely. We bought a lot from webstaurant that is good quality but this was not a great product. Thank you for your review! We're sorry to hear your mop broke. 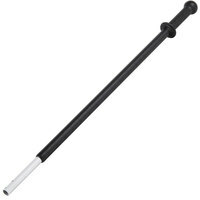 For a more durable handle, try this Unger 54" Mop Handle. Great handle, I love the easy of length adjustment and the quick disconnect and it is very light. My only complaint is you guys put your shipping stickers on it which don't peel off easily, still really fast shipping! Super long and very light. Can fly through dry mopping work and the extender features is very easy to extend and retract with out skipping a beat. Extremely durable grip and easy to adjust the height. Stores away easily and effortlessly unscrews from the mop head! Great buy for any kitchen or hotel. I have been using this type of mop for almost 8 years now commercially and I love it! Great control and it gets the job done with little or no effort ( I used to get on my hands and knees to clean the floor). Great mop for the price and will last a long time! The price makes this mop stick very affordable! It is easy to attach to compatible mop heads! Telescoping feature makes it easy to use at any size!! This is a great handle. Its paired with the matching head, and microfiber mop. Very sturdy and lightweight. I love that its adjustable, makes it easy to get into different sized areas.